Review: When I read the little blurb on the cover (“One girl will save us all.”), I couldn’t help hearing Katara from Avatar: The Last Airbender’s voiceover. Prophecy, like Avatar, is pretty epic. And like Avatar, world-building is definitely one of its strengths. The fantasy setting of Prophecy is a refreshing change from the usual dime-a-dozen medieval European setting. Prophecy is set in Hansong, which is inspired by ancient Korea. Hansong, as one of seven kingdoms, is drawn into conflict with other nations such as Yamato when the demons begin to invade. With the heroine Kira as cousin to the prince of Hansong, you get to see the royal court at work. The only issue I had was with the politics, which was a little overwhelming at first, but once I got into the story, I figured it out. From the setting to the tone, Prophecy has a rock solid setting for Kira’s journey. Kira herself is fantastic. It’s always great to see a heroine at the center of an epic fantasy. The plot — fulfill the prophecy! find magical treasures! — is nothing new, but Kira brings it to life with her spirit and determination as she fights to protect the prince and the kingdom. And I love the addition of the trusty dog Jindo. Every quest needs an adorable (and surprisingly clever) dog along for the ride. 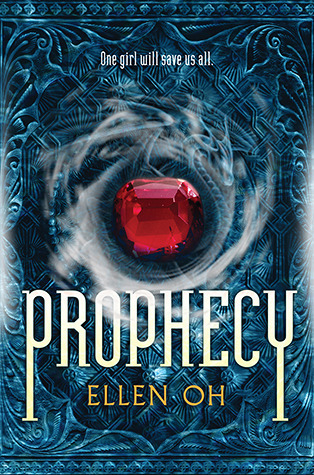 With its tightly written fantasy setting and fierce heroine, Prophecy is a great addition to the fantasy genre. I look forward to reading the sequel next year. Recommendation: Get it soon, especially if you love fantasy. You mentioned the magic words: Katara of Avatar. 🙂 That always gets my attention. I’ll have to look for this book! !